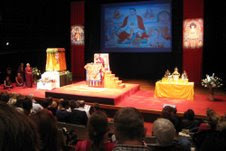 The final event of His Holiness Karmapa’s visit to the U.K. took place on the evening of Thursday 30 July. Hosted by the Diamond Way, His Holiness bestowed the initiation of Marpa Lotsawa. Lama Jampa Thaye and family, accompanied by many Dechen sangha members, attended the initiation and were graciously received by the Diamond Way sangha. His Holiness carefully explained the significance of Marpa to the Karma Kagyu tradition and expounded at length on Marpa’s great kindness in travelling to India in order to introduce the profound teachings to Tibet. The following morning His Holiness departed from Heathrow airport on his way to Graz in Austria to continue the European leg of his tour.